Day 6 - Friday 30th June - SILVER & BRONZES! 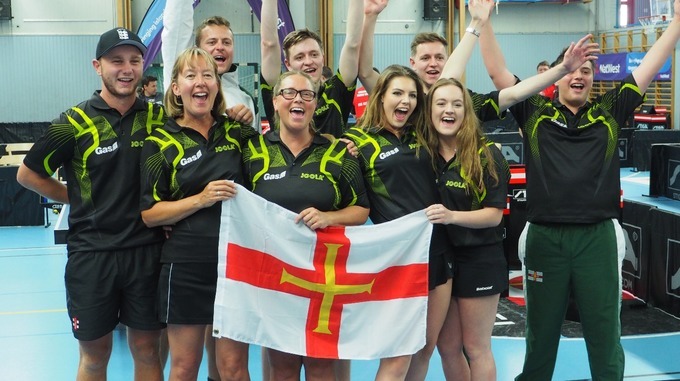 The Guernsey table tennis team added a silver and three bronze medals to their haul on the final day of competition in Visby, Gotland. The silver medal was earned in the Men's Doubles after Garry Dodd and Josh Stacey dispatched Gotland's Niklas Ahlgren and Max Hedbom 3-0 in the semi final to play the gold medal match against Aqqalu & Ivik Nielsen of Greenland. The Greenlanders had a good start and won the first 2 games before Dodd & Stacey pulled a game back in front of a vocal Guernsey crowd. Howevr the Nielsens proved too strong and clinched the gold medal in the 4th game, winning 11-8, 11-4, 7-11, 11-9. In the Men's Singles, Garry Dodd lost in the semi-final 4-1 to Bjorn Axelsson from Gotland. Axelsson went on to win gold and was also the same opponent who knocked Garryout the event in Jersey in 2015. Dawn Morgan was defeated in the Women's Singles semi final in straight games by eventual gold medallist Marina Donner from Aland 11-8, 11-4, 11-7, 11-7. The Women's doubles pair of Charlotte Casey and Daisy Kershaw marked their first Island Games with a bronze medal after losing to the strong Gotland pairing of Lina Olofsson and Annika Ahlgren 3-0. Day 5 - Thursday 29th June - BRONZE MEDAL! There was plenty more action in the singles and doubles events today, featuring the whole Guernsey squad. There are representatives in semi finals of all 4 remaining events tomorrow. It was a bronze medal for Guernsey in the Mixed Doubles tournament this morning. The event was won by Marina Donner and Johan Pettersson from Aland, who beat Bjorn Axelsson and Evalina Carlsson from Gotland in the final. Earlier Garry Dodd and Dawn Morgan had been beaten in the semi-final by the Gotland pair 11-8, 11-8, 10-12, 11-7. Dawn Morgan is the Guernsey representative in the semi-finals of the Women's Singles rafter beating Rosa-Marie Petersen and Elin Schwartz both 3-1. Charlotte Casey had a good run to the quarter final but finally succumbed to Faroe's Henrietta Neilsen 11-5, 11-4, 11-5. Meanwhile Sam Kershaw and Daisy Kershaw were both beaten in the round of 16 this afternoon by opponents from Gotland and the Isle of Man respectively. The top Guernsey pairing of Garry Dodd and Josh Stacey made it through to the semi finals of the doubles with a comfortable quarter-final win over Donald Hobbs & Oliver Stanifort of the Isle of Wight. Lawrence Stacey and Ben Foss were narrowly defeated by Luc Miller and Chris Morshead in the Round of 16 (11-9, 5-11, 11-9, 6-11, 6-11). Charlotte Casey and Daisy Kershaw will contest the semi-final against a Gotland pair after beating Kerenza Baker and Katherine Vinas from the Isle of Man by 3 games to 1. Top pairing Dawn Morgan and Sam Kershaw are out however after being defeated by Evelina Carlsson and Elin Schwartz 11-8, 11-7, 11-8 in the quarter final. Another good day for the table tennis team, with the singles and doubles events commencing. Garry Dodd, Josh Stacey and Lawrence Stacey all qualified top of their respective groups. Ben Foss is out after losing out on countback and finishing 3rd in his group, despite an excellent win over Poul Petersen. Dawn Morgan, Sam Kershaw and Daisy Kershaw are all safely through to the next round of the Women's singles, while Charlotte Casey had a good start against Margarida Mir from Menorca, winning 7-11, 11-4, 10-12, 11-7, 10-12, she still has two matches left to play. Garry Dodd and Josh Stacey won their group, sealing top spot in thrilling style by beating the Aland pair of J-m Bergo & Johan Pettersson 1-11, 11-9, 6-11, 11-4, 17-15. Lawrence Stacey and Ben Foss are also through in 2nd place in their group after losing to the strong Gotland pairing of Nisse Lundberg & Bjorn Axelsson. They will play the Jersey pair of Luc Miller and Chris Morshead in the Round of 16 tomorrow. Both Guernsey pairings are through to the quarter finals with both pairings coming second in their respective groups. Dawn Morgan and Sam Kershaw will face a tough quarter final against Evelina Carlsson and Elin Schwartz from Gotland while Daisy Kershaw and Charlotte Casey will play the Isle of Man. All 4 pairings are safely though to the Round of 16, with Dodd and Morgan at their most impressive in winning Group 2. Lawrence Stacey and Charlotte Casey picked up an excellent win over Bjorn Axelsson and Evelina Carlsson from Gotland, though a narrow defeat to the Faroe Islands meant they finished as runners up in Group 3. Day 3 - Tuesday 27th June - TEAM GOLD! The Guernsey table tennis team were victorious in the team event final today after edging out Greenland 4-3 in a thrilling final. With the tie balanced at 3-3, it was Josh Stacey who held his nerve in the final match against Poul Petersen to claim a 3-1 win and win another Island Games team gold medal. Guernsey are through to the final of the team competition after a nail-biting 4-3 semi-final win over hosts Gotland. Garry Dodd and Dawn Morgan each won a singles match and teamed up to win the Mixed Doubles to leave the tie poised at 3-3. In the final match, Josh Stacey produced a superb comeback from 2 games down and then 5-0 down in the deciding end to clinch the match.